This year my husband started coaching Basketball at the middle school where he works. He’s used to coaching football but this was his first time coaching Basketball. Although he tries to remind his student athletes to leave their valuables at home, with their family or to keep them on the bus but it never fails that someone brings something valuable on the court and my husband ends up being responsible for keeping it safe. Master Lock has been helping people secure their valuables for years so it was inevitable for us to find something he could use on their site. 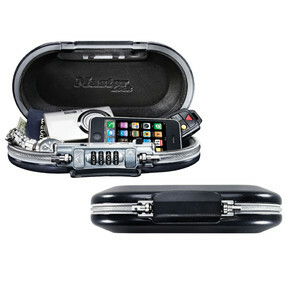 We received a Master Lock Portable Personal Safe for review, any opinions expressed are our own. Keeping items safe at sporting events (like my husband does). Keeping travel documents safe while traveling. Securing valuables while you’re at college. Keep documents safe in the car. Ideal for recreation, campus, office, travel or leisure use. The safe comes in three colors; grey, white and a pink to help support breast cancer awareness. Overall it’s a great item to help you keep your items safe and secure. It’s a tool the whole family can use and it’s not super expensive either. At the low price everyone in the family can have their own portable personal safe. Master Lock wants to pass on the feeling of safety to one of my readers. One lucky reader will win their own personal portable safe. US Residents 18 and older can enter to win until April 1st at 11:59 PM. Enter via the tool below.